The Great Black Hawk that has been attracting birdwatchers to Portland’s Deering Oaks Park was found on the ground with frostbitten feet on Sunday. It was transported to Avian Haven in Freedom where it is being cared for. A great black hawk that made itself at home in Portland’s Deering Oaks Park was rescued during Sunday’s storm after suffering from frostbite. Two volunteers came across the bird on Sunday morning, and the raptor was on the ground and unable to stand under its own power, according to Avian Haven, a wild bird rehabilitation center in Freedom. The two handed off the injured hawk in Topsham to Avian Haven volunteers, who brought the bird the rest of way to the rehabilitation center, Avian Haven said in a Facebook post. 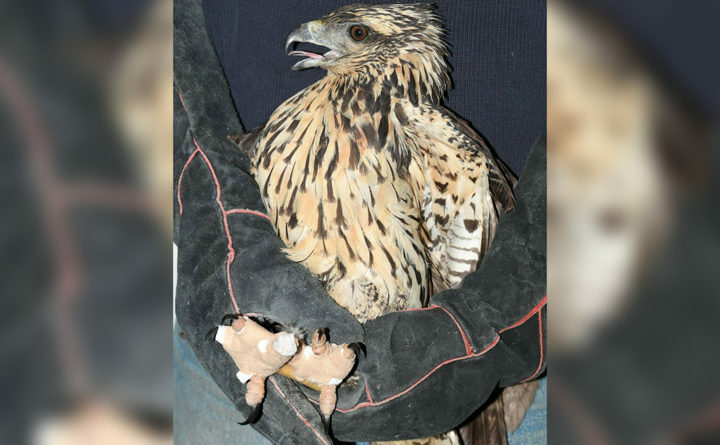 “The hawk seemed nearly dead when it left Portland, but was provided with plenty of heat for the trip and had its eyes open when checked at the Topsham hand-off,” Avian Haven wrote in the post. Great black hawks do not usually fly north beyond Mexico, and it’s unclear what brought this particular bird so far beyond its normal range. But the tropical bird ran into trouble Sunday when a major storm brought freezing temperatures, snow and sleet to the state. The Deering Oaks hawk suffered frostbite on its feet, but Avian Haven reported that by Monday morning the bird’s condition appeared to be improving, with it alert and standing.